Looking for a bit peculiar peony? Are you a fan of pastel-coloured flowers? Well, Cora Louise is the peony for you. The lavender-coloured heart of this Itoh peony is surrounded by light, white petals. Despite her shorter life in the vase, this peony is a must have for pastel lovers. Like many other peonies, Cora Louise was registered by Anderson. Other creations of this breeder are Canary Brilliants and Callie’s Memory. Compared to other peony varieties, these peonies do have a shorter life in the vase. Luckily they make up for that with their outstanding colours: every single one of them is a sparkling flower. Cora Louise is a so-called x hybrid or Itoh. 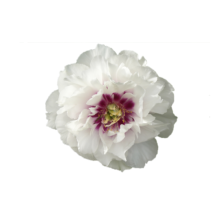 This means that this peony is a cross-breed between a tree peony and a lactiflora. Tree peonies often struggle to soak up enough water while being in the vase. As a result, they do not last long. My Peony Society has invested in new nutrition in order to keep Itoh’s fresh for more days: at least four. With our nutrition, this flaming peony will be able to shine at your event or party.